Tele-dermatology is a branch of tele-medicine in which the medical facilities are provided by the use of tele-communication technology. This includes the exchange of data over a long distance by different means of communication like audio, video, image. Telemedicine company focused on building a better way to see the doctor, has announced USD 15 Million of investment in a series of funding.
. The technology can also be used for consultation and educational purposes. In this era of digitalization and the recent developments in the tele-communication industry a growth for the global tele-medicine market is projected to reach new heights in near future. In order to reduce the gap between supply and demand in the medical facilities many company across the globe are giving their best to attract investors to extend their services in the tele-dermatology field. For instance, the U.S. Department of Telemedicine (DLT) has announced USD 8.6 million for the development of tele-health sector of the country. Iagnosis, a U.S. based company providing telemedicine solutions, has raised USD 5 Million to launch an expanded mobile platform for sharing rashes and skin problem images with dermatologists. Likewise, Spruce, a U.S. based telemedicine company focused on building a better way to see the doctor, has announced USD 15 Million of investment in a series of funding. Many remote areas and undeveloped communities are facing a shortage of dermatologists and still wait for the treatment in long queues. Tele-dermatology technology has the potential and can completely satisfy the increasing demands for dermatologists. Tele-dermatology involves the use of communications technology which reduces the time taken to operate the patient provide skin care across the globe and it is an extensively investigated branch of tele-medicine. Due to rapid development in mobile technology, tele-dermatology is a rapidly evolving field which provides face to face consultation between patient and specialist. Low acceptance level in developing countries is one of the major barriers in the growth of telemedicine. Patients from developing countries avoid these types of services due to lack of education and awareness. 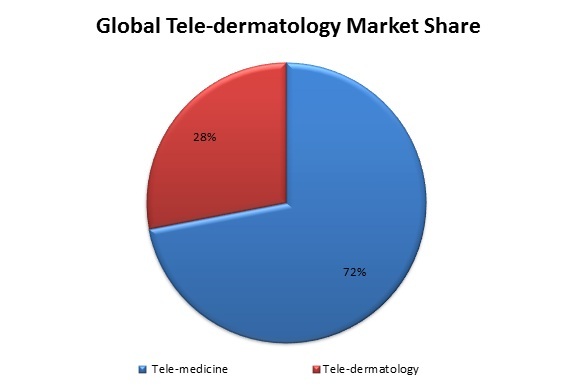 Lack of computing awareness, slow internet connections are also the major restraints of Tele-dermatology market growth. Tele-dermatology enables the dermatologist to consult the patient remotely. But, dermatologist faces number of problems if they want to give their service in another state as Tele-dermatology licensing rules are different from state to state. In 2015, USD 3.39 billion revenue is generated by the application of Tele-dermatology globally. Dermatology is a perfectly fit for telemedicine due to its uniquely visual disposition that is face to face contact between specialist and patient. With the rapid evolution of communication technology, we can now conduct high-resolution live video chats and data transfer between patient and specialist over the smart mobile phones anywhere in the world. The idea of telemedicine is becoming prominence in this developing era of digitalization. Tele-dermatology, in particular, is becoming the “next big thing” for the upcoming time. Research Nester is a global market research and consulting firm helping organizations, private entities, governments undertaking, non-legislative associations and non-profit organizations. With our decades of experience in the market research, we help our clients to gain a competitive edge over other players. Thus, helping them making strategic yet dynamic decisions for the future investments.